Many of us associate adjustable beds with hospitals. Some of us (probably in a certain age group) are increasingly bringing those adjustable beds into our homes. The Wall Street Journal recently reported that these "hospital beds [have] become one of the hottest products in the US furniture industry." These adjustable beds are expensive but won't be disappearing soon. The retailers have strong financial incentives to stock their showroom floors with these beds. The adjustable beds may have certain advantages over the traditional, flat beds. However, lying at an incline will likely increase pressures on a person's bottom and decrease comfort for some people. The reasons for the increase in pressures are relatively simple. 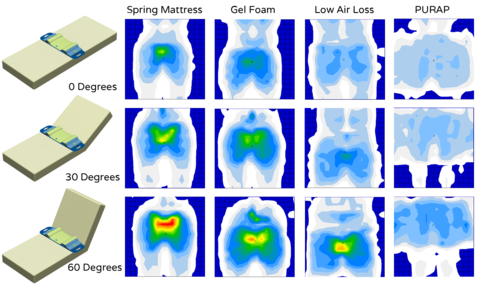 As the bed's incline increases, more body weight is borne by one's bottom, pressure on the person's bottom increases, and pressure related discomforts likely increase also. 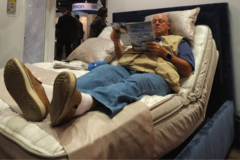 If the trend reported by the WSJ article continues, we will have to design better mattresses to remain comfortable while we read or watch TV from our beds.